TVXQ and Girls’ Generation will both spend the Lunar New Year break with their families. Both groups performed at the SM Town in Tokyo concerts on the 25th and 26th and appeared on Asahi TV’s ‘Music Station’ on the 28th. While Girls’ Generation is focusing solely on their Japanese activities, TVXQ is busy flying between Korea and Japan to perform in both countries. TVXQ’s single album ‘Why? (Keep Your Head Down’ was able to sell 231,000 copies in its first week of sales. The preview of “Journey” was released just a little over an hour ago. Now the full version is now available on online websites such as Bugs and Melon. “Journey” features Seohyun of SNSD, whose voice compliments well with the bass and tenor voice of U-know Yunho and Max Changmin of TVXQ. The songs speaks of a couple who go on a trip together and go on a “journey”. This track has been highly anticipated by fans as it gives a fresh look at TVXQ not found in the special version of the album. “Journey” will also be used as the OST song for Max Changmin’s upcoming drama “Paradise Ranch”. TVXQ released their special edition album on January 5th, which included a 100-page photobook and 10 tracks. The normal edition album is set to be release next week on January 12th. This edition will have an extra track not found in the special edition version. The bonus track “Journey” features SNSD’s maknae, Seohyun. The song will also serve as an OST track for Changmin’s upcoming drama ‘Paradise Ranch’. This will be the second OST track found on the album. The song “Athena” was used as an OST song for the drama ‘Athena: Goddess of War’. ‘Paradise Ranch’ will begin airing on January 24th on SBS on Mondays and Tuesdays. Changmin plays the lead role as the character Han Dong Joo. He marries Lee Da Ji (played by Lee Yeon Hee) at a tender age of 19, but ended up divorcing. Years later, the two reunite and rediscover their feelings for one another. Don’t forget to pick up your copy of TVXQ’s 5th album! SM Entertainment has released an official statement regarding the contract revisions demanded by the Fair Trade Commission. After numerous discussions with the FTC, SME drafted a new contract earlier this year with the changed terms mentioned in the previous article. All artists re-contracted with the agency under the new terms, which were acknowledged by the FTC to be fair. The Fair Trade Commission said Monday it was considering questioning the nine-member K-pop band Girls’ Generation regarding unfair artist-management agreements known as “slave contracts” allegedly prevalent in the entertainment industry. The anti-trust watchdog affirmed that it was considering the group’s testimony regarding the matter that had been brought to national attention by popular boy band TVXQ since 2009 when they became embroiled in a legal tussle with former management, SM Entertainment. The FTC said it had an interest in questioning the band about clauses in their contract to determine whether claims made by TVXQ held water, since Girls’ Generation are currently under contract with the same agency. “It is true that (Girls’ Generation) were mentioned as possible witnesses to testify regarding TVXQ’s charges of alleged unfair contracts administered by SM,” a spokesperson with the FTC said. The investigation reportedly began with TVXQ’s fanclub demanding the FTC look into SM’s business practices with its talent, saying the company leveraged a deal that placed the group at a disadvantage by abusing their dominant position as one of the industry’s leading management camps. In August 2009, three members of TVXQ left Xia, Micky, and Hero with the group citing problems with their contract as the reason for their exit. Pundits and talking heads say even if members of Girls’ Generation were to be asked to testify, it is likely none would place their careers on the line by disclosing sensitive information about their management. “Doing that would be career suicide,” a producer and songwriter for a prominent international record label who wished to remain anonymous told The Korea Herald. The FTC is currently reviewing documents presented by SM as evidence the agency hopes will exonerate them from such charges. Seriously, why SNSD out of all groups out there? Obviously, they won’t talk against SM Entertainment because it will be the end of their group if they do so. How dumb can FTC get? I can’t imagine they even considered these girls to speak about SME’s “slave contracts.” This is just plain stupid. 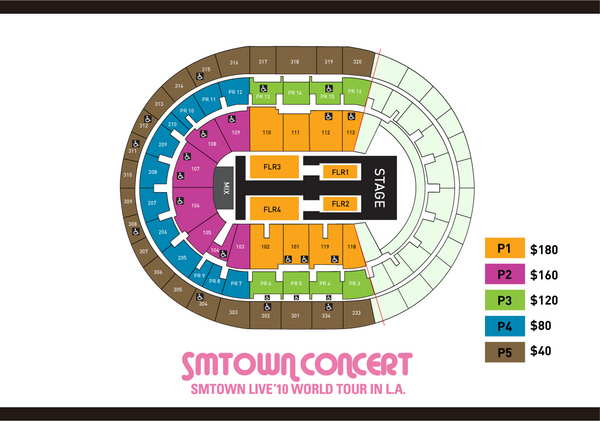 Ticket information for SMTown Live ’10 World Tour in Los Angeles has been revealed. A: Tickets will go on sale SATURDAY, JULY 24, 2010 at 10:00AM PST. Q: Will there be presales? A: No, there will be no presales for this event. A: You may purchase tickets via Ticketmaster at www.ticketmaster.com, STAPLES Center Box Office, and Powerhouse by calling 323-692-0303. Q: Can I purchase tickets at a Ticketmaster retail outlet as well? Q: Will the STAPLES Center Box Office still be open on a Saturday? A: Yes, tickets will be available to purchase at the box office starting the first day of ticket sales. A: The ticket prices are $180, $160, $120, $80, and $40. Q: Are there any VIP Packages for this event? A: No, there will be no VIP Packages available for this event. Q: Is there a ticket limit when purchasing? A: Yes, the ticket limit for both Ticketmaster and the STAPLES Center Box Office will be 8 per order. Powerhouse will have no ticket limit. Q: Where do I make group purchases? A: You will only be able to make group purchases with Powerhouse. Please call us at 323-692-0303. Q: What is the discount for group purchases? A: There is a 10% discount for group purchases of 10 or more tickets. Q: Can I reserve or hold seats ahead of time? A: No, tickets will go on sale for everyone at the same time on SATURDAY, JULY 24, 2010 at 10:00AM PST. Tickets will be sold on a first-come,-first-served basis. Please visit Powerhouse at www.powerhouselive.net for more details. * Since the Powerhouse Staff will be assisting customers one-on-one over the phone, it may take longer for you to get through. We ask that you please be patient. If you require more convenient, faster service, we suggest that you utilize the Ticketmaster website or the STAPLES Center Box Office. ** The resale of tickets is strictly prohibited. Info on the SM TOWN Live 2010 World Tour. Beyond Asia to the world, we’re moving toward a large-scale music festival! Friends, lovers, and the whole family can enjoy together this exciting summer music festival! Official Tour is currently is in preparation. For more information about Official Tour performers will be informed on the coming July 9th (Fri), please be patient.